The Definitive Guide to Java RTS for Developers and Architects For Java developers and architects moving to real-time, and real-time developers moving to JavaWalks through start-to-finish case study applications, identifying their constraints and discussing the APIs and design patterns used to address themWritten by the former leader of the real-time Java standards process and one of Wall Street's top real-time developersSun Microsystems' Java Real-Time System (Java RTS) is proving itself in numerous, wide-ranging environments, including finance, control systems, manufacturing, and defense. 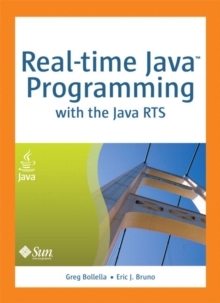 Java RTS and the RTSJ standard (JSR-001) eliminate the need for complicated, specialized, real-time languages and operating environments, saving money by leveraging Java's exceptional productivity and familiarity. In Real-Time Java (TM) Programming, two of Sun's top real-time programming experts present the deep knowledge and realistic code examples that developers need to succeed with Java RTS and its APIs.